If you live in Bonita Springs, Florida, you understand how destructive and devastating a hurricane can be! Located between Naples and Fort Myers, Bonita Springs is known for its numerous beaches and parks, including Lovers Key, Bonita Beach and Little Hickory. Bonita Springs is also subject to both hurricanes and tropical storms. Hurricane protection is your first line of defense. Without protection, your property is subject to the heavy winds and rain that accompany storms endangering both you and your possessions. Stay out of the dark with our clear polycarbonate storm panels. Storm Guard Solutions offers the security of clear storm panels, also known as polycarbonate panels for your home or commercial property. Old metal panels leave the interior of your home dark and are very heavy and hard to install. When you choose our clear polycarbonate storm panels you will love the way our panels are optically clear which allows light to enter your home so that you are not left in the dark when the power goes out and the sun goes down. Our clear polycarbonate storm panels are strong, simple and affordable!! Our panels are also light weight making it easier to install than other types of panels. Clear polycarbonate storm panels perform many functions. First and foremost, clear storm panels protect your home from any flying debris during a high wind storm or hurricane. Without the protection of storm panels your home is left prone to damages should a hurricane occur. If the wind should cause objects to become airborne, the windows of your home or business can become damaged allowing water and wind to enter your home. If the wind enters your home, there is a chance that your roof may also be blown off leaving the property utterly devastated. Your home or business is your most valuable asset. Living in South Florida it’s not a question of IF we will be subjected to intense storms or hurricanes, it’s more a question of WHEN. 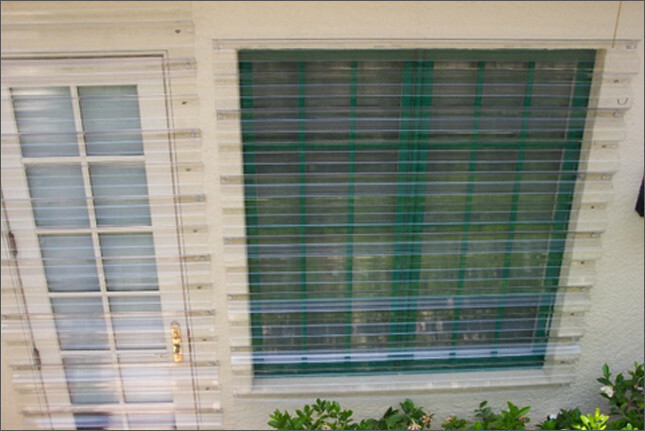 The time to invest in clear storm polycarbonate storm panel protection is now, before the next hurricane gets named. Stay safe and be smart. What are the Advantages of Clear Polycarbonate Storm Panels? • Our optically clear panels are lightweight, making it easier to install than other types of storm panels. • Our panels can be cut to any shape which makes it easy to accommodate the architecture style of homes in South Florida. Polycarbonate storm panels can be cut to fit arches and geometric shaped windows. • Our panels offer several different mounting methods which can be used depending on safety, aesthetics and ease of deployment. • Our panels are documented as the strongest and the clearest in the industry. • Our panels come with a 10-year manufacturer’s warranty. Our team of experts have over 2 decades of experience providing quality hurricane protection in Southwest Florida. Our commitment is to provide our clients with superior products at fair prices. All our products are manufactured in our newly expanded and updated facility under strict quality control guidelines. Our hurricane solutions and simple and affordable! Don’t wait until the next storm comes along, take care of “what matters most” and call Storm Guard Solutions today.